BPX6 is made for IT, automotive industry-, aerospace industry-, medical industry-, and other industry used tools. 5 Axis tool grinding center with an additional axis for swiveling the grinding spindle. Machine mainly used for manufacturing of cylindrical or non-cylindrical cutting tools. Diameter range from 0.8mm up to 16/25mm and a maximum tool length of 200mm. The machine can be optionally equipped with a 3 axis automatic loading system, anti-collison system, accurate clamping and high accuracy holder for work piece. 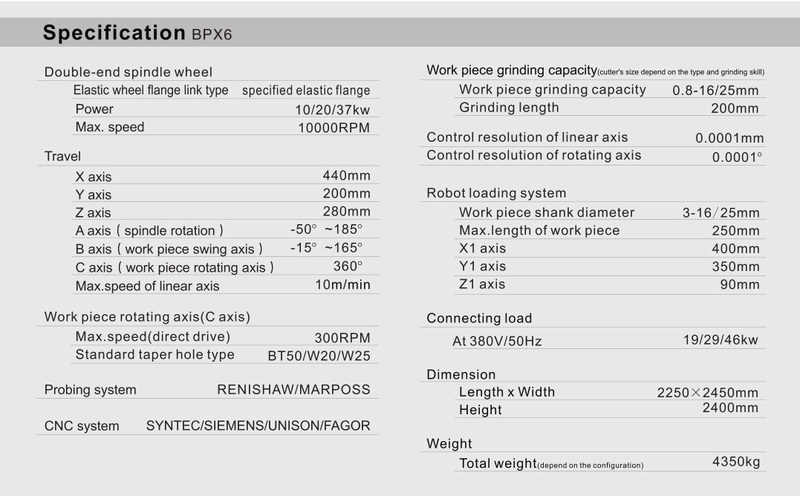 BPX6 is made for IT, automotive industry-, aerospace industry-, medical industry-, and other industry used tools. 5 Axis tool grinding center with an additional axis for swiveling the grinding spindle. Machine mainly used for manufacturing of cylindrical or non-cylindrical cutting tools. Diameter range from 0.8mm up to 16/25mm and a maximum tool length of 200mm. The machine can be optionally equipped with a 3 axis automatic loading system, anti-collison system, accurate clamping and high accuracy holder for work piece. 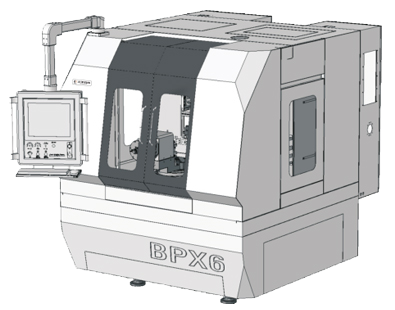 BPX6 is one of the most reliable tool grinding machines on the market. – Granite swivel table for high accuracy and temperature stability.